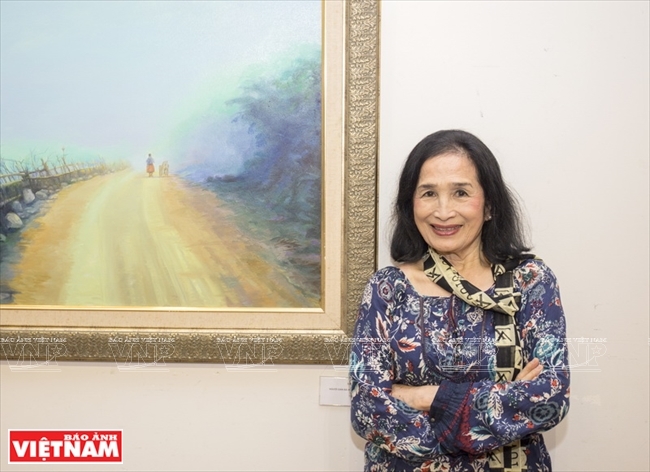 If acting has brought fame to Tra Giang, one of the country’s first and leading movie actresses, painting has given her peace in life. 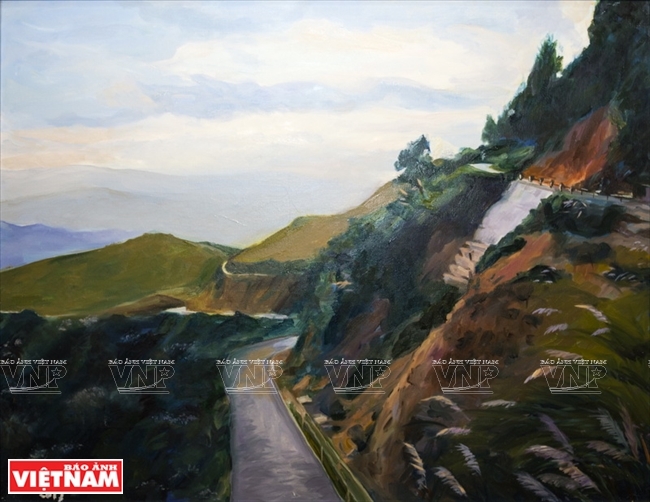 Her journey from cinema to painting is a story connecting metres of films with brush strokes in the life ofthis talented woman. People’s Artist Tra Giang, is remembered by generations of Vietnamese film lovers for her impressive roles in Vietnam’s canon films in the 1960s-70s, including Chi Tu Hau (Mrs Tu Hau – 1962), Vi tuyen 17 ngay va dem 17th Parallel, days and nights -1972), and Bai ca ra tran (Song to the front – 1973). Tra Giang won the best actress award at the Moscow International Film Festival in 1973 for her role, Diu, a southern woman, inVi Tuyen 17 ngay va dem directed by People’s Artist Hai Ninh. Tra Giang ended her cinema career at the age of 47 after finishing the filmDong song hoa trang (White flower river) by Tran Phuong. 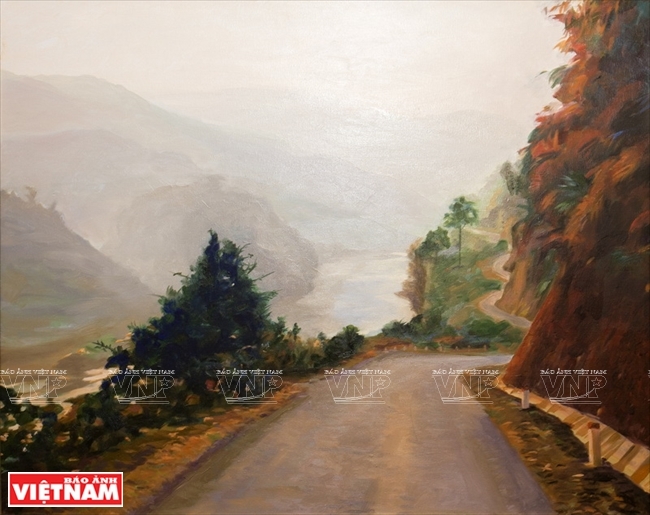 Painting just came to her life accidentally when she moved to Ho Chi Minh City. 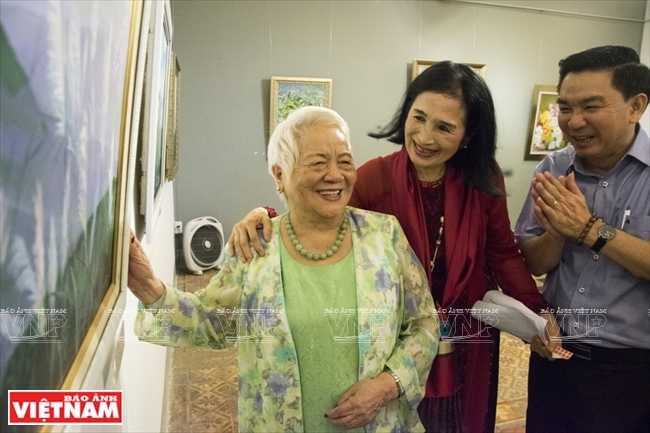 In early 1999, she visited female artist Le Thi Thoa, the wife of late General Tran Van Tra. 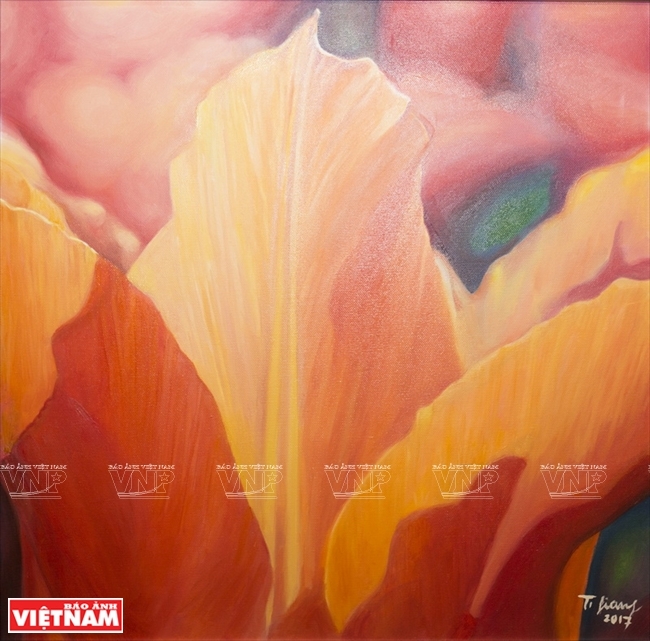 Giang was very impressed with the beautiful paintings in Thoa’s home. 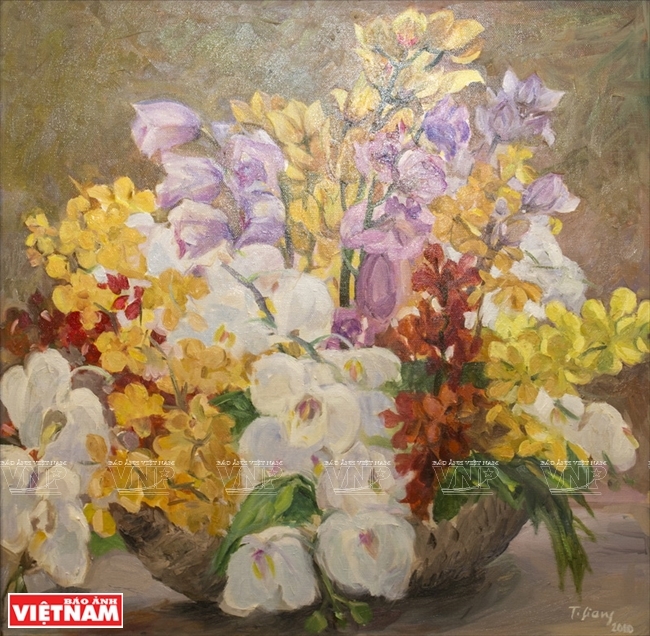 She decided to pursue painting and went to classes at the Ho Chi Minh City Fine Arts Association three times a week. 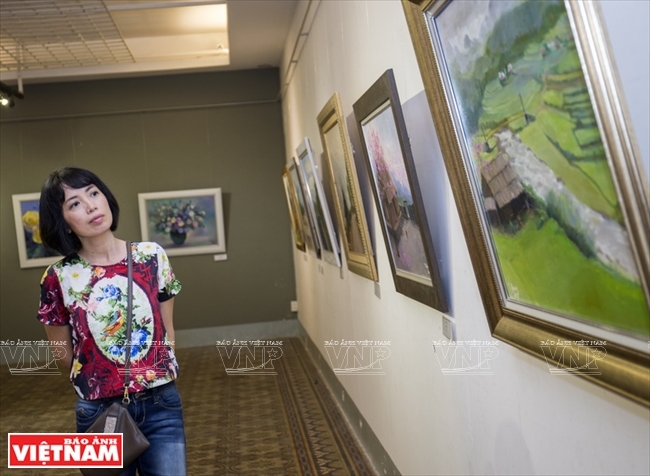 When her abilities grew better, Giang joined the annual exhibitions of painters’ group Huong Co (Grass Scent). 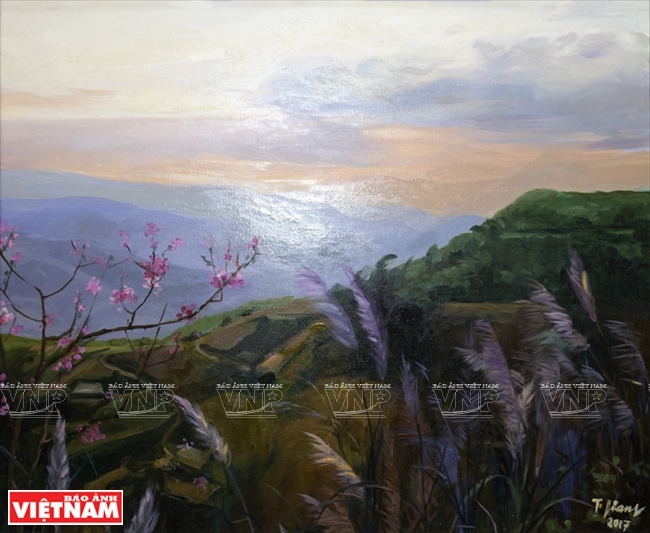 The more Tra Giang spends time on painting, the calmer she finds her soul. 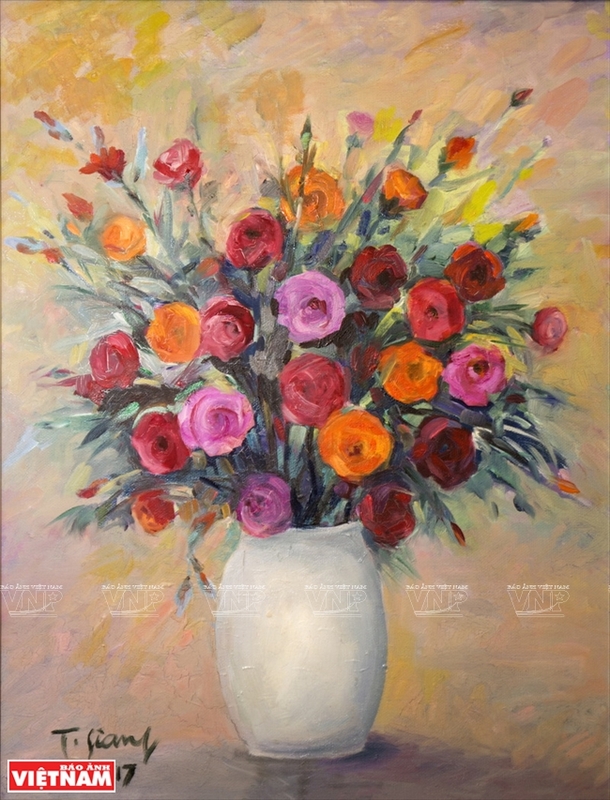 She sends all her thoughts and feelings to paintings, just like to her film roles previously. 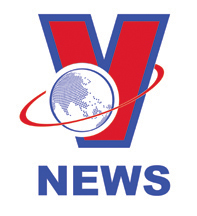 People's Artist and movie star Tra Giang. 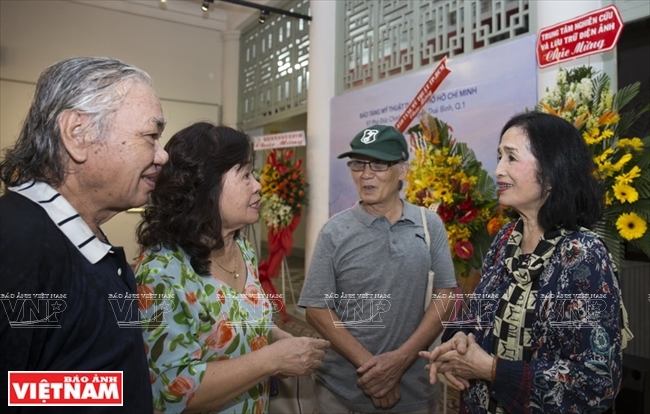 Tra Giang's friends visit her exhibition. 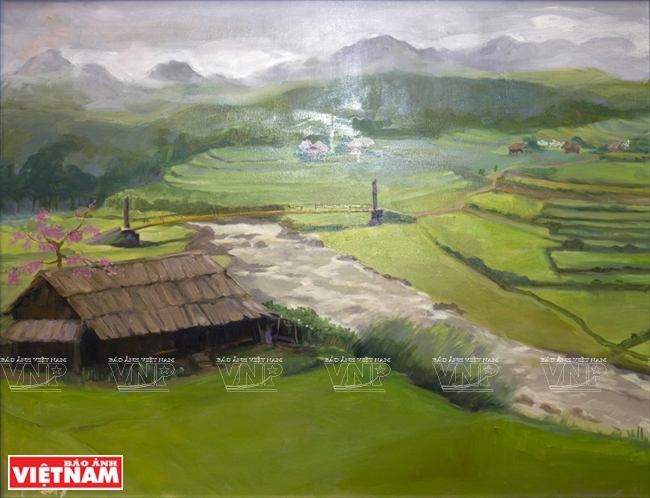 Tra Giang explains how her paintings are born. 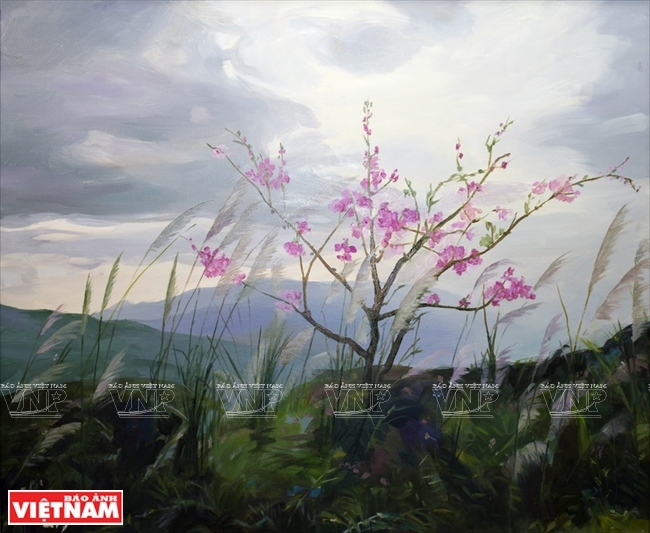 Tra Giang's impressive brush strokes attract viewers. 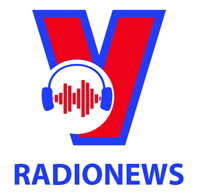 “Qua mien Tay Bac” receives attention from foreign visitors. 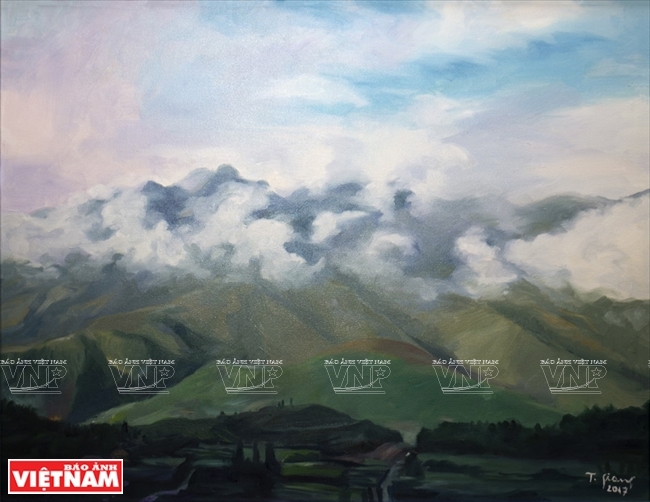 In January, at the age of 76, Tra Giang opened her third solo exhibition, Qua mien Tay Bac (Passing through the Northwest), which showed 30 oil paintings she created in 2016 and 2017. 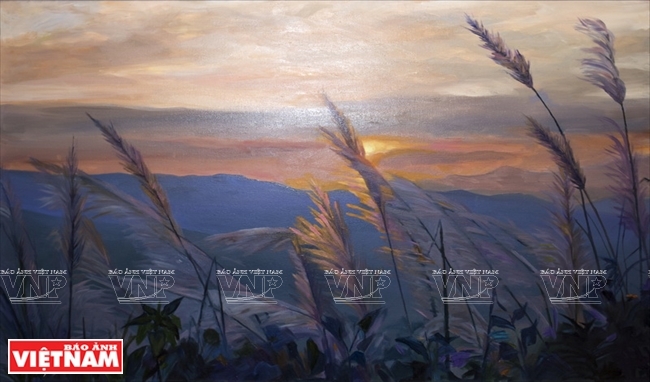 The paintings feature the beauty of nature and people in the mountainous region. 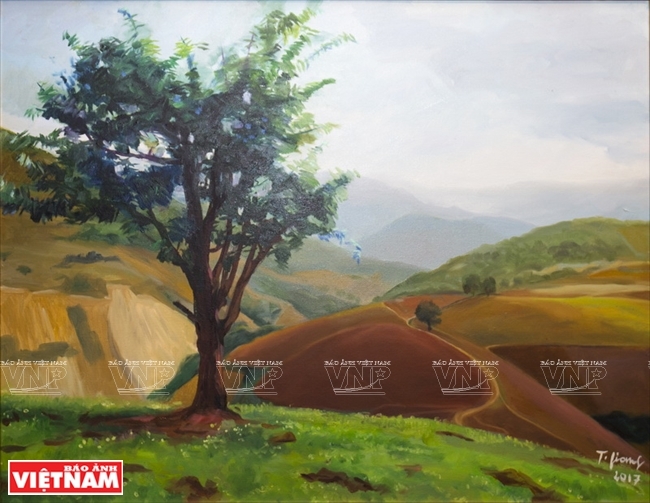 Qua mien Tay bac followed Tra Giang’s first and second exhibitions, He ve (Summer arrives) in 2006 and Mua xuan (Spring) in 2016. 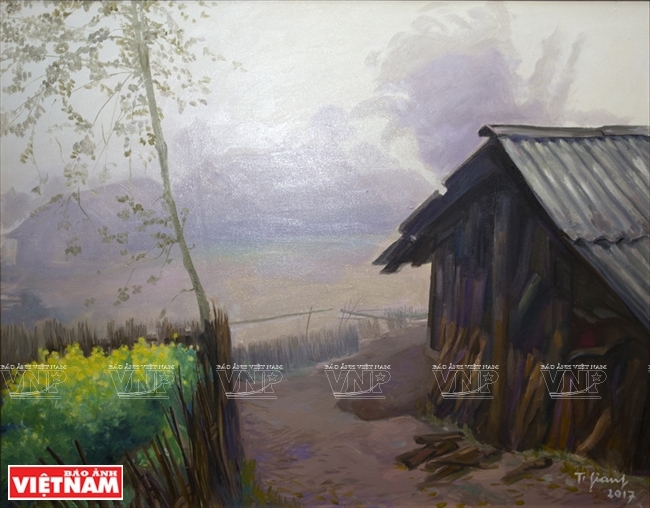 The colours of her paintings are not striking but as clear as the character of Tra Giang, the painter who loves nature and simple things around her. All three of her exhibitions visibly showed this. 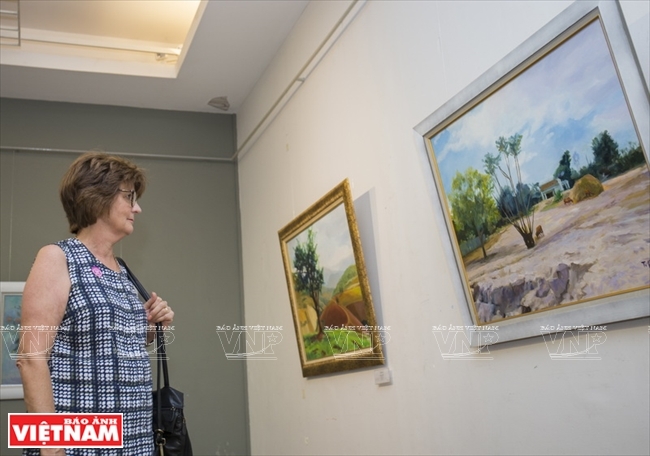 At this stage of her life, painting has become Tra Giang’s companion as her husband Professor Nguyen Bich Ngoc passed away and her only daughter, pianist Bich Tra is living and working in the UK. A H Mong woman in the mist. 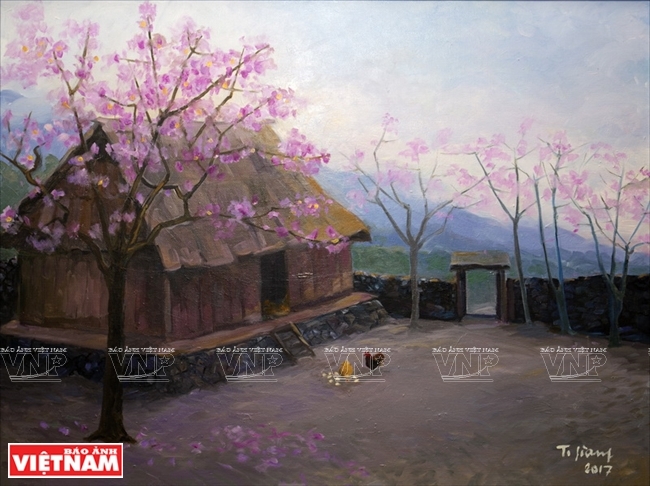 Xin Chai village in Sa Pa.
A gift for the women's day. 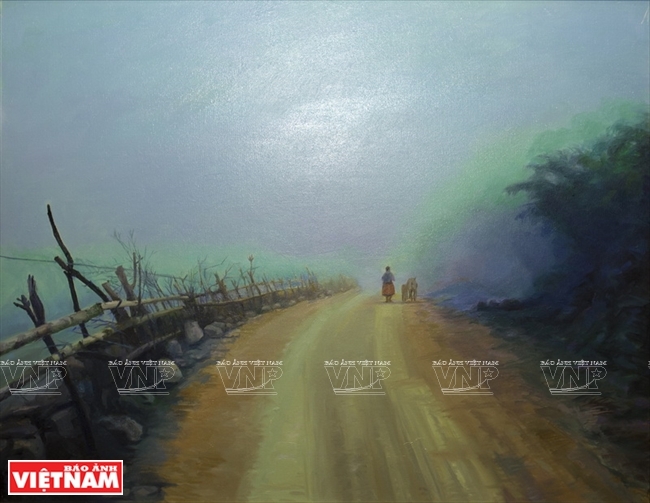 People’s Artist Tra Giang opened her third solo painting exhibition, Qua mien Tay bac (Passing through the Northwest) at Ho Chi Minh City Fine Arts Museum on January 8, 2018.